The Child Welfare Act 1947 was the principal legislation governing child welfare in Western Australia, regulating the treatment of children sent to WA as unaccompanied child migrants after 1947 as well as all others in out of home care in the State. The Act repealed the State Children Act 1907 (as amended to 1941) but essentially retained the scope of the earlier legislation. Its purpose was to 'consolidate and amend' the laws for 'the protection, control, maintenance and reformation of neglected and destitute children' and related matters. New provisions included enabling penalties against a child to be withheld if it could be shown that circumstances such as a child's upbringing or health had contributed to the offence (s.26). The Act was amended many times during the 1950s and 1960s but was not greatly changed until the Child Welfare Amendment Act (No 2) 1976 was implemented. The Child Welfare Act 1947 was eventually repealed by the Children and Community Services Act 2004 on 1 March 2006. Generally required that children who were 'neglected' or 'destitute' should not be placed in an industrial school (s.41.2). Industrial schools were for children who were found guilty of an offence (s.41.1). However, the court might identify 'special circumstances' (s.41.2) that enabled it to send a 'neglected or destitute child' to an industrial school, or allow the Minister to approve the transfer of a child 'for misconduct' from another institution to an industrial school. Enabled the police or any officer of the department to return a 'ward who absconds from any institution, from his foster-parent' or any service placement or apprenticeship to be apprehended and 'conveyed to such institution' of the Secretary's choice (s.46). Required young people who were wards of the State to be released from departmental control when they reached 18 years of age. Young women could have their wardship extended to 21 years of age (s.49). Although the Act was amended many times during the 1950s and 1960s, it was not greatly changed until the Child Welfare Amendment Act (No 2) 1976 was implemented with a number of modernisations. The Child Welfare Act 1947 was eventually repealed by the Children and Community Services Act 2004. Subsidised institutions were named in the Child Welfare Act 1947. 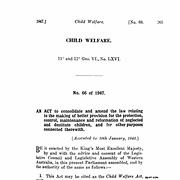 The Investigation into the Administration of the Child Welfare Department of Western Australia by RH Hicks made recommendations about the Child Welfare Act 1947. The Child Welfare Act 1947 s.138 included children in the entertainment industry in the definition of 'neglected child'. The Criminal Code Amendment Act 1965 updated the Criminal Code to be consistent with provisions in the Child Welfare Act 1947. The Disability Services Amendment Act 1999 made special provision for children as defined by the Child Welfare Act 1947 as being 'in need of care and protection'. The Native Welfare Act 1954 made the Commissioner of Native Welfare the guardian of all Aboriginal children except those who had been made wards under the Child Welfare Act 1947. The Child Welfare Department administered the Child Welfare Act 1947. Sources used to compile this entry: To Remove and Protect: Aboriginal Lives Under Control [website], 2010, http://aiatsis.gov.au/collections/collections-online/digitised-collections/remove-and-protect; ; Law Research Service, Melbourne Law School, Law Library, The University of Melbourne. 'Find and Connect Project - Western Australia Legislation', 13 December 2013, held in the project files at the University of Melbourne eScholarship Research Centre.